I’ve really loved being at home with both children this half-term. We’ve done lots of fun things, enjoyed being outside amidst glorious autumn colour and spent time with loving grandmothers. Yet in the background my email inbox has been pinging away with writing rejections. I don’t often write about my writing – any free time, just for me, is crammed full of creativity, and I find that writing about that creativity seems to be a hindrance to me doing more creative things. So I admit, I’m not great at letting people know what I’m up to. But on the writing front it has been busy! I have pretty much finished editing my first novel, I’ve written a few short stories, several pieces of flash fiction and many poems. And I’ve actually been sending them out (which, I find, to be the greatest faff of all!). I’ve been pretty organized about my submissions recently and kept a note of what I’ve been sending out. I can see that since July I’ve made 21 submissions. I do feel a great sense of achievement for just getting those things out there. After years of sending work out, I’m pretty philosophical about rejections. I try to see it as a pleasant bonus to be published; the real treasure is in the craft of writing, when my Muse takes flight and I find myself transported to another world. But… being a highly sensitive person, I still find that a part of me takes rejections personally, and so I cannot help but find that they lower my mood. I really do understand the odds. It’s tough finding just the right magazine/publisher/online site for that piece of writing; and then of course I know that there must be several hundred (or perhaps several thousand) other writers submitting their work alongside mine too. And each one of us hopes for the ‘yes’ that gives us a sense that what we are doing is worthwhile, and even, perhaps, wins us a little bit of much-needed money. Rejections are absolutely manageable, but when they’re accompanied by a chest full of cough and cold, huge amounts of work to do for my other job as founder of a small press, and continued financial uncertainty in our family finances it somehow all feels like too much. It feels as though the ‘down time’ is here to stick around for a while. 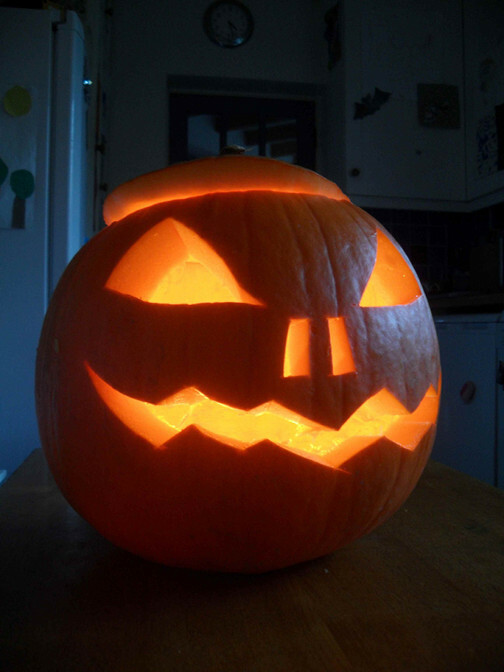 Tonight as I go trick-or-treating with the kids I hope that our own Jack-o’-lantern will serve to ward off some of the spookiness of rejections; I especially want it to banish those tricksy thoughts which come unbidden alongside a rejection: What’s the point of all this effort? Maybe you’re just not cut out to be a writer.